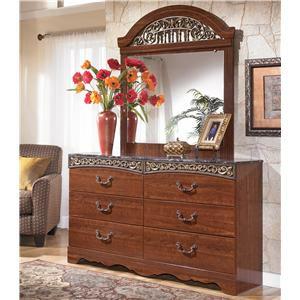 The Fairbrooks Estate bedroom collection features warm finishes and ornate detailing to create a furniture collection that is sure to enhance your bedroom decor with an inviting traditional design. 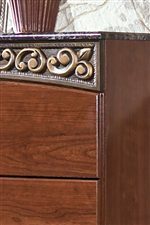 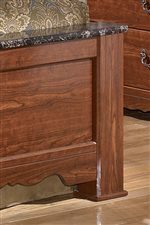 The glossy cherry finish that flows smoothly over the replicated cherry grain is beautifully enhanced by the deeply carved scroll motifs finished in an antique gold color and the ornately decorated inserts. 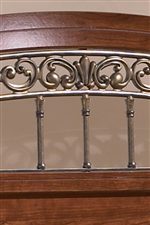 With the large scaled swinging bail hardware with rosettes in an antique gold color handle, this collection flawlessly captures the warmth of finely crafted traditional furniture. 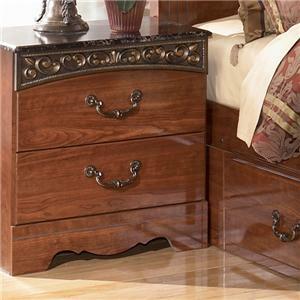 Enhance your bedroom decor's beauty with the traditional style of the Fairbrooks Estate bedroom collection. 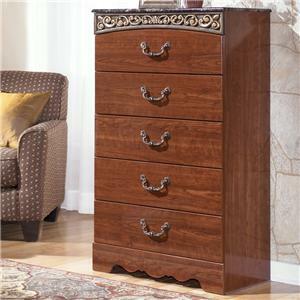 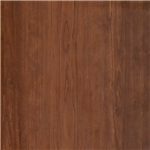 Browse other items in the Fairbrooks Estate collection from Nassau Furniture and Mattress in the Long Island, Hempstead, Queens, Brooklyn, Bronx, Manhattan NY area.